Not long ago, the most affordable option for total tooth loss was a removable denture. Dentures, prosthetic (false) teeth set in gum-colored acrylic plastic bases, can effectively restore function and appearance. But the appliance continues to have one major drawback: it can accelerate bone loss in the jaw. Like other living tissues, older bone cells die and become absorbed into the body (resorption). Normally they're replaced by newer cells. The forces generated when we chew our food travel through the teeth to stimulate this new growth. This stimulus ends when we lose our teeth, and so cell replacement can slow to an abnormal rate. Eventually, this causes bone loss. Removable dentures can't provide this stimulation. In fact, the pressure generated as they compress the gums' bony ridges can even accelerate bone loss. That's why over time a denture's fit can become loose and uncomfortable — the bone has shrunk and no longer matches the contours of the dentures. 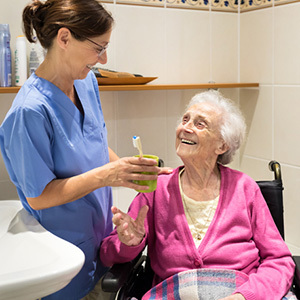 In recent years, though, a new development has been able to provide greater support to dentures while at the same time slowing or even stopping bone loss. 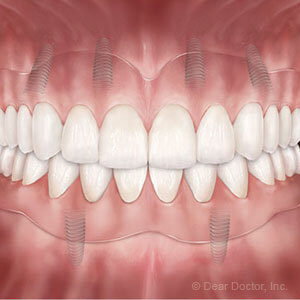 We can now support dentures with dental implants. Implants are best known as individual tooth replacements: a titanium metal post replaces the root, while a life-like porcelain crown attaches to the post to replace the visible tooth. In addition to providing a longer-lasting alternative to removable dentures, implants provide a very important health benefit: they improve bone density because they mimic the function of natural teeth. Bone cells are naturally attracted to the titanium; they adhere to the titanium post and are stimulated to grow through the action of chewing, increasing bone density and securing the implant's hold in the jaw. Using the same technology we can support removable dentures, or even full fixed bridges. Rather than rest directly on the bony ridges, a denture can make a secure connection through a coupling system with just a few strategically placed implants. We can also permanently attach a full bridge by fastening it to a few implants with screws. Not only do we eliminate the pressure from dentures compressing the gums and bone tissue, we can actually stimulate bone growth with the implants. Although more costly upfront than traditional dentures, unlike traditional dentures which must be replaced every five to seven years, long-lasting implants may be more cost-effective over the long-run. It's National Nutrition Month! Good nutrition is key to overall health, but poor dental health can have a big impact on your ability to get the right nutrients. Your mouth is the first step in the digestive system, so if teeth and gums are in poor shape, food choices can be severely limited. 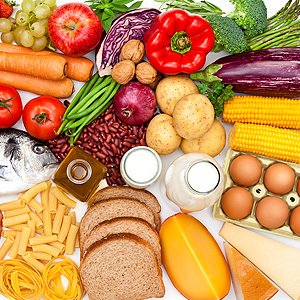 Here are some nutritional guidelines that will benefit your oral health as well as your overall health. Crunchy fruits and vegetables scrub debris from your teeth during chewing and stimulate the production of saliva, which neutralizes acid and helps rebuild tooth enamel. Dark, leafy greens are a good source of iron, calcium and many vitamins that are good for your teeth and gums. Several fruits have vitamin C, an essential for healthy gums. Bananas have magnesium, which builds tooth enamel. Many yellow and orange fruits supply vitamin A, which keeps the soft membranes in your mouth healthy. Go for dairy. Dairy products—for example, cheese, milk and unsweetened yogurt—neutralize acid as well as contribute tooth- and bone-strengthening minerals such as calcium and phosphorus. Eat whole grains. An excess of refined carbohydrates can lead to chronic inflammation, which contributes to gum disease and many other ailments. However, the complex carbohydrates found in whole grains work against inflammation. Lean proteins are essential for keeping your teeth and gums healthy. Good fats such as those found in salmon and nuts work against inflammation. In addition, nuts stimulate the production of saliva and contain vitamins and minerals to keep teeth strong. Legumes are a great source of many tooth-healthy vitamins and minerals. Limit sugary or acidic foods and beverages. Acid from certain foods and beverages can weaken tooth enamel, leading to cavities. The bacteria in your mouth feed on sugar and release acid that eats away at tooth enamel, causing cavities. How you eat and drink also affects dental health. For example, if you indulge in sugary treats, do so with a meal if possible so that other foods can help neutralize the acid. And if you drink lemonade or soda, don't brush your teeth immediately afterwards. Instead, wait at least 30 minutes before brushing to give your saliva a chance to neutralize the acid. Getting the right nutrition for a healthy body requires good dental health, so it pays to take good care of your teeth. For a lifetime of good oral health, choose foods that keep your teeth and gums healthy, and don't forget to schedule regular dental checkups to make sure your teeth and gums are in great shape. If you have questions about diet and oral health, please contact us or schedule an appointment for a consultation.